Image by Crowley Maritime Corp. Shipping to Puerto Rico? Crowley's Commitment Class modernization project and begins a new era of world-class supply chain services between the island commonwealth, U.S. mainland and the Caribbean Basin. The second of Crowley Maritime Corp.’s new combination container/roll-on roll-off “ConRo” ships - MV Taíno, one of the first of its kind to be powered by liquefied natural gas (LNG) - completed its maiden voyage to Puerto Rico on Friday morning, Jan. 11. The successful transit puts a historic capstone on the company’s Commitment Class modernization project and begins a new era of world-class supply chain services between the island commonwealth, U.S. mainland and the Caribbean Basin. MV Taíno, which departed Jan. 8 from its mainland homeport of Jacksonville, Fla. (JAXPORT), is the second of two ConRo vessels constructed for Crowley. Sister ship MV El Coquí began its first-in-class service in July 2018. The ships, built specifically for the Puerto Rico trade, are 219.5 meters (720 feet), 26,500 deadweight tons (DWT), and can transport up to 2,400 twenty-foot-equivalent container units (TEUs) at a cruising speed of more than 22 knots. The ships carry a wide range of cargo types and sizes, including: 53-foot by 102-inch-wide, high-capacity containers; up to 300 refrigerated containers; and 400 cars and larger vehicles in the enclosed and ventilated vehicle garages that are unique to the trade. With the addition of MV Taíno to its fleet, Crowley’s Commitment Class vessels are part of an overall logistics system, which increases supply chain velocity and reduces friction and landed costs for customers shipping through Jacksonville as a gateway to Puerto Rico, the Dominican Republic and the islands of the Caribbean Basin. MV Taíno is named for the native Puerto Ricans who lived off the land with great appreciation and respect for their environment, and MV El Coquí is named for the popular indigenous frog on the island. Both vessels are operated with U.S. crews by Crowley’s global ship management group under Crowley Shipping. The vessels were constructed by VT Halter Marine at its Pascagoula, Miss., shipyard, with construction management provided by Crowley Solutions. 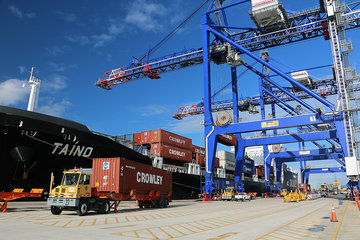 Modernizations by Crowley include the Commitment class vessels along with investments at Crowley’s Isla Grande Terminal in San Juan, including three new shore gantry cranes, the first to be delivered in Puerto Rico in 50 years; a new 900-foot pier; container handling equipment; and efficiency improvements. Further, an innovative new terminal operating system (TOS) leverages technology to reduce gate turn times for trucking partners, significantly enhancing cargo velocity for customers. Additionally, a proprietary feeder service has been launched to seamlessly link Puerto Rico to the Dominican Republic and other islands of the Caribbean Basin. At JAXPORT, a new shoreside LNG fuel depot operated by Eagle LNG Partners supplies the cleaner, efficient fuel powering the ships. LNG is a cleaner, more efficient fuel that offers significantly reduced emissions compared with other fuels, such as including a 100-percent reduction in sulphur oxide (SOx) and particulate matter (PM); a 92-percent reduction in nitrogen oxide (NOx); and a reduction of carbon dioxide (CO2) of more than 35 percent. More information on the full range of enhancements can be found at this special Crowley microsite, conro.crowley.com . Crowley has served Puerto Rico since 1954, longer than any other U.S. shipping company.